Rhodium finished 23-jewel mechanical movement with eight adjustments, monometallic compensation balance, swan neck micrometer adjustment to the regulator (tension screw and bridge missing), movement stamped with the Seal of Geneva, two-tone silvered dial with pink gold Arabic and baton hours, subsidiary constant seconds, minute recording dial, outer fifth second and tachymeter scales, pink gold hands, circular brushed and polished case with flat bezel, rectangular pushers in the band and snap on back, period 18ct pink gold buckle, dial, case, movement and buckle signed. Production of Ref:533 began in 1937. 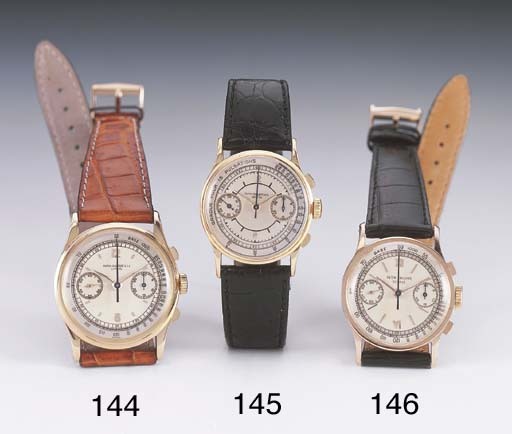 Ref:533 with the combination of pink gold case and two-tone dial is exceptionally rare.